Curious Zelda strikes book deal, will it be next cute pet hit for licensing? 16th August 2018	Lifestyle Comments Off on Curious Zelda strikes book deal, will it be next cute pet hit for licensing? 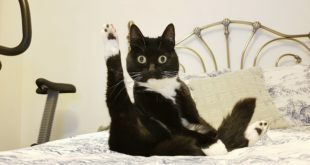 Sphere is publishing the first book of the London rescue cat - called Curious Zelda - whose startled look has attracted a following of more than 80,000 feline fanatics on Twitter.